Gilder Lehrman Collection #: GLC07334.02.01 Author/Creator: Moore, Francis (fl. 1874) Place Written: s.l. Type: Document signed Date: 1 September 1874 Pagination: 2 p. ; 32.6 x 21.5 cm. 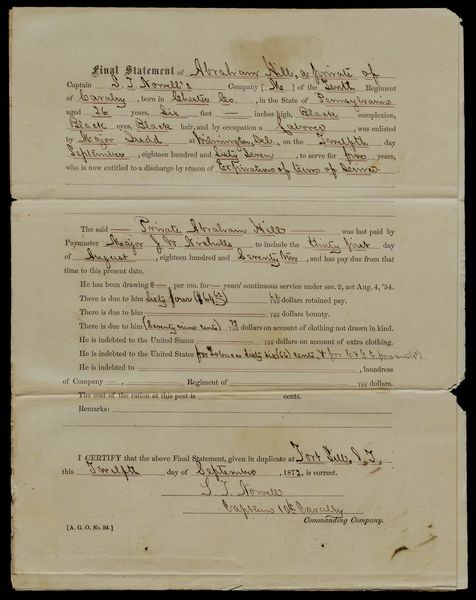 Summary of Content: Signed by Moore as Captain of the 9th Cavalry. States that Gains, an African American Private in Company L of the 9th Cavalry, enlisted in Philadelphia, Pennsylvania 1 November 1873, and is discharged by reason of special order no. 131. Reports that Gains was last paid by Major J. W. Nicholls, United States Paymaster.